Okay. 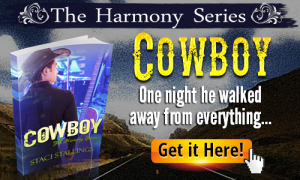 So if you stopped by the blog last week on Thursday or Friday, you know that my book “Cowboy” was free. Or it was supposed to be free. And it was… for about 14 hours. Which goes to prove that even with the best of intentions and attention to detail, sometimes things happen that we did not expect, and we have to be ready to shift to Plan B in a hurry–even when there was no Plan B in the first place. #1 I took “Cowboy” off of sale on Barnes & Noble 10 days ago. #3 I set up the promos and decided to do an extra free day at the beginning. I had been promoting it all day, and suddenly, the book I’d told everyone was free was selling for $6.99. Worse, I had several free day promotions set to hit the street in 7 short hours! PANIC! THEN I found an email saying Amazon didn’t think it was exclusive, but the email had come over Spring Break, and I had missed it. I didn’t THINK I had the book posted anywhere else, so I emailed them asking what to do. In the meantime, I contacted my friend and promotions manager and explained the situation (that’s the calm version, the one I will actually admit to!). He said he would look into it. Well, after about an hour of utter panic, come to find out “Cowboy” WAS on another site… iTUNES of all places! Say what?! I never put it there. In fact, when I tried, I ran into roadblock after roadblock until I finally gave up (and that was 2 years ago!). It took another 15 minutes of trying to figure it out only to find out that my print publisher that I put “Cowboy” on in 2001 had “grandfathered” all my books into ebooks at some point and just started putting them on sites. So, then it was frantically emailing the sites who were going to say it was free the next day to beg and plead for them to change it to 99cents. So, first off, if you got the message it was free and then it wasn’t, that’s why. Secondly, life is going to throw you some real curveballs, and it may or may not be your fault. When that happens, BREATHE. Call in reinforcements if possible. Shift to Plan B… and most of all, do a WHOLE lot of praying! One of the best things about all of this was having a “team” or “network” of support already in place that I could ask for prayer immediately. That went a long way to helping me know we were going to find a way through this mess. Also, even in yourself, get good at going to God in the small things, so when the big things hit, it’s an automatic. I can’t say I was a model of calm in the storm. One of the things that I value is honesty, and when my own honesty and integrity suddenly got put on the chopping block through an innocent mistake, that storm came up quickly and literally out of nowhere. Maybe you’ve had a few storms like that in your life. Maybe you’ve had a few glitches, honest mistakes, and life pitfalls. I’m here to attest that you can and will make it through them, and by the grace of God be not worse for the wear in the end. But I am not going to tell you they are fun because they are not! Just know, however, that they’re going to come up, and be ready to be flexible in and with the Holy Spirit! Because believe me, the Holy Spirit was the only thing keeping me from utterly crashing into those waves. Thank you to everyone for your patience with me! I’m not perfect, but I am trying!